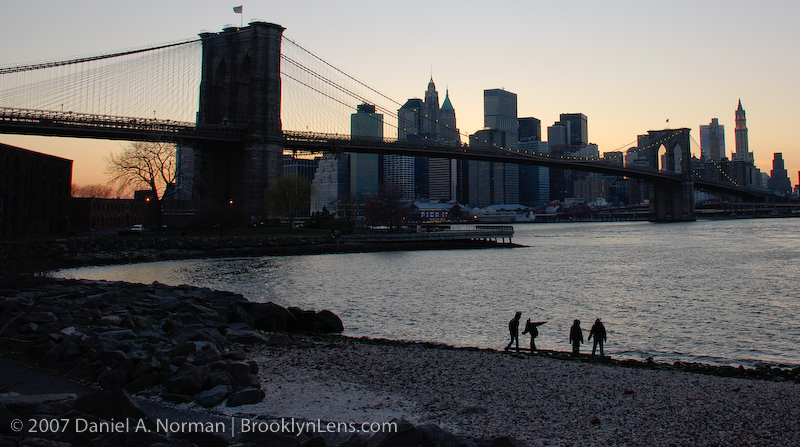 A view of the Brooklyn Bridge with the silhouette of 4 girls playing by the East River. The sun is setting and the New York City lights are coming on. Enjoy the image: New York City Brooklyn Bridge. The redevelopment of Brooklyn Bridge Park has created some exciting new outdoor spaces in Brooklyn, with some fantastic views of the New York City Brooklyn Bridge. There is so much to do down by Brooklyn Bridge park, and it’s space that is accessible to all New Yorkers. Brooklyn Bridge and Brooklyn Bridge Park is a nice area for photographers to work on some images of New York and the Manhattan skyline. It is also a popular area for tourist to view and photograph NYC. From the base of the Brooklyn Bridge, you can photograph some incredible images of New York City. This entry was posted in New York Bridges, New York Street Photography (Color) and tagged brooklyn bridge, brooklyn photography, BROOKLYN SUNSET, manhattan, new york photography, nyc, nyc sunset, SILHOUETTE, street photography, sunset. Daniel A. Norman (born 1980) is a visual artist and photographer based in Brooklyn, New York. Daniel is currently working on a New York Street Photography project. Daniel's work is held in corporate and private collections and has been exhibited internationally.